NET LEASE 100 • SHOPPING CENTER BUSINESS • May 2018 National Retail Properties (NYSE: NNN) and Realty Income (NYSE: O) ended 2017 at around 4.5 percent or higher, accord- ing to industry trade group NAREIT. That was more than 150 basis points above the benchmark 10-Year Treasury yield. "There are not a ton of other options out there for the typical investor or that a person with capital to deploy can feel c o m f o r t a b l e with," states Chris Sands, founder and CEO of Charles- ton, South Carolina-based Sands Invest- ment Group, which has brokered $3.3 billion in sales since 2010. 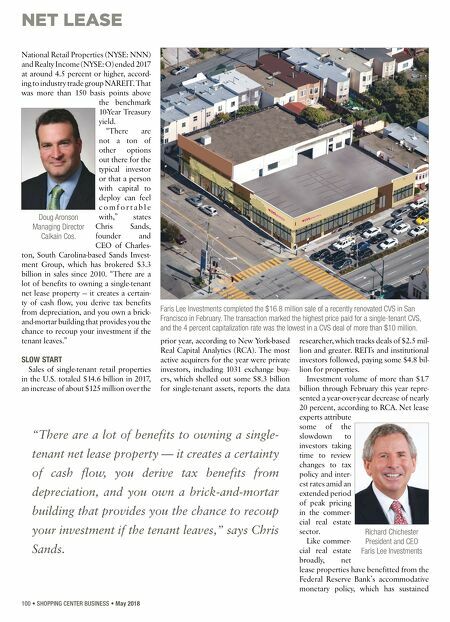 "There are a lot of benefits to owning a single-tenant net lease property — it creates a certain- ty of cash flow, you derive tax benefits from depreciation, and you own a brick- and-mortar building that provides you the chance to recoup your investment if the tenant leaves." SLOW START Sales of single-tenant retail properties in the U.S. totaled $14.6 billion in 2017, an increase of about $125 million over the prior year, according to New York-based Real Capital Analytics (RCA). The most active acquirers for the year were private investors, including 1031 exchange buy- ers, which shelled out some $8.3 billion for single-tenant assets, reports the data researcher, which tracks deals of $2.5 mil- lion and greater. REITs and institutional investors followed, paying some $4.8 bil- lion for properties. Investment volume of more than $1.7 billion through February this year repre- sented a year-over-year decrease of nearly 20 percent, according to RCA. Net lease experts attribute some of the slowdown to investors taking time to review changes to tax policy and inter- est rates amid an extended period of peak pricing in the commer- cial real estate sector. Like commer- cial real estate broadly, net lease properties have benefitted from the Federal Reserve Bank's accommodative monetary policy, which has sustained Richard Chichester President and CEO Faris Lee Investments Faris Lee Investments completed the $16.8 million sale of a recently renovated CVS in San Francisco in February. The transaction marked the highest price paid for a single-tenant CVS, and the 4 percent capitalization rate was the lowest in a CVS deal of more than $10 million. Doug Aronson Managing Director Calkain Cos. "There are a lot of benefits to owning a single- tenant net lease property — it creates a certainty of cash flow, you derive tax benefits from depreciation, and you own a brick-and-mortar building that provides you the chance to recoup your investment if the tenant leaves," says Chris Sands.